Last post we have gone through some basic of Network administration, In this post we will be targeting some Advance features of Network administrations as like Link Aggregation, IPMP (IP Multipathing) features. Before going in deep we can see some basic concept of networking. Bandwidth : Bandwidth is bit rate for sending and receiving data over the network. Failover : Capability to have a backup component for the one becomes unavailable. 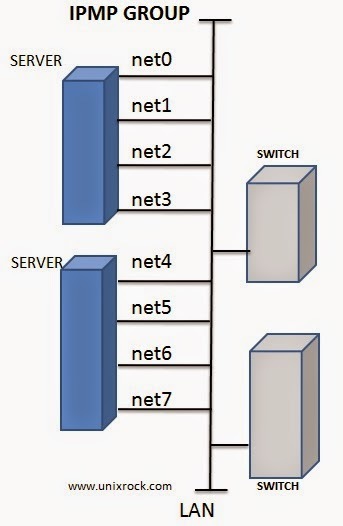 Load balancing : Distribution of workload to achieve best utilization. Link Aggregation is combination of two or three physical interface on the system which are consider as a single logical unit (aggr) that provides best bandwidth, automatic fail over features, load balancing and redundancy benefits. Link Aggregation's Link should be in same Speed and same mode. We can administrate the link aggregation with using dladm command by adding, modifying, deleting links. 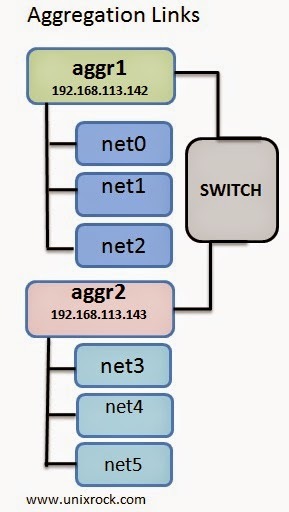 Yes...we have done the aggr0 aggregation link with using net1 net2 net3 physical link and assigned Ip address too. Let we start Creating an IPMP group and Adding IP address to an IPMP group and Deleting and disable the IPMP group. Thanks for reading this post. Please leave your valuable comments and queries, I will get back to you at earliest possible.